Nightshade is a very compelling book which is why the writing surprised me. The synopsis pretty much summed up the story in a few mere words involving a love triangle, the awakening/rebellion period and then the actual decision which is very predictable. But for me, it has always been about the story rather than its level of predictability. Well, I try to be reasonable. And no, I am not suggesting that I would rather read the last page of the book before reading the entire book. The first few pages of the book, though intriguing, never really do justice to the reason behind Calla acting the way she did. If it is such a lawbreaker thing to save humans then fascination with one couldn't be tempting enough to make her do it. But then, maybe it's about a sudden thought mutation to rebel, but I am not going along with that theory. Suffice it to say that it was rather disappointing how the book opened. Moving on, the main three characters have unique names which was very welcoming to me. Plus, they seemed to suit to their personalities perfectly. Although, Shay kept reminding me of the word shy which he was anything but. But his actual name, Seamus is rather a little disgusting. Calla Tor proved to be a very likable character, but not all the time. Especially the ones where she literally melts in the arms of Ren and Shay, both. This was a very disturbing but repetitive aspect of the love triangle. I mean, all she knew about Ren was that he was a heavy dater, that she hated him and that she was to become his alpha mate. But then all of a sudden she is drowning in his lingering touches and then kisses like she doesn't want to stop? On Ren's part, it was similar, but I thought the lack of girls in his life made him act that way towards Cal. With absolutely no emotions involved whatsoever as there seemed to be no basis. Seamus or Shay Doran was my one of my favorite characters in the book. He was a mixture of everything from vulnerable to unbeatable to loving and cute. Though he was a loner, I didn't particularly liked the way Cal acted towards him when Ren was near. The slap he got from Cal was also uncalled for. For the most part, Shay was the most reasonable and understanding character. Renier Laroche was a different story altogether. At first, I outright hated him but then I liked how he handled his jealousy and his territorial instincts towards Cal were understandable. But in the end, he was the most well-formed character in Nightshade. I liked his hidden vulnerability more than I could imagine myself doing that. Which is why Ren also made it to my favorite character list in Nightshade. The story was well-paced and I enjoyed the read till the end. The home, school and outside scenes were managed well. There were some surprises as well along the way. Such as I have always wondered how did the werewolves changed forms and the approach Andrea Cremer took in Nightshade was very innovative and believable. On a different note, it was rather a different approach that Ren ignited the crazy passion in Cal and Shay, the slow and steady one. Usually, it is the other way round so I don't know if it's a signal or just something different. Other characters were also well-formed and balanced. I liked reading the details about the different paranormal characters in the book. Nightshade proved to be a very enjoyable read and the cliffhanger is suspenseful enough. 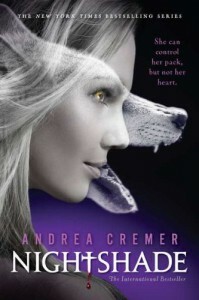 I am hoping that [b:Wolfsbane|11417912|Wolfsbane (Nightshade #2)|Andrea Cremer|http://ecx.images-amazon.com/images/I/51X2uGbkH5L._SL75_.jpg|8342392] delves deeper into the personalities of Shay and Cal and brings out similar action. I am a sucker for it!